The Ohio State University has named Dr. James L. Moore III, a prominent researcher and scholar, as its next vice provost for diversity and inclusion. Moore – the Education and Human Ecology’s Distinguished Professor of Urban Education and executive director of the Todd Anthony Bell National Resource Center on the African American Male – has served as interim vice provost and chief diversity officer since last May. With Dr. Michael V. Drake at the helm, OSU continues to position itself as a leader in promoting diversity and inclusion among top research institutions, particularly among African-American students. In a letter to the college community, OSU’s executive vice president and provost, Dr. Bruce A. McPheron, praised Moore’s leadership skills. “During the past year, he has served as the university’s primary thought leader on diversity and inclusion matters related to faculty, staff, students, and the community and has helped develop and implement the strategic diversity vision for the university,” said McPheron, adding that Moore provided oversight of 20 programs and initiatives and managed a budget of over $10 million. Moore is the right person for the job, said those who know him. A native of Lyman, S.C., Moore earned his bachelor’s degree from Delaware State University and his Ph.D. in counselor education from Virginia Tech. Last year, Moore was included in the 29th edition of the South Carolina African-American History Calendar, placing him in the company of other well-known South Carolinians who have been recognized, such as Ronald McNair, Althea Gibson, James Brown and the Rev. Jesse L. Jackson, Sr.
Moore is the author and editor of numerous books and peer-reviewed journal articles. “Dr. 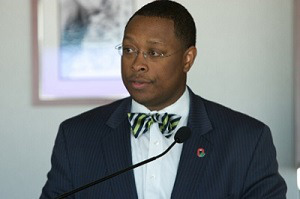 Moore’s work and vision are uniquely suited for addressing a myriad of challenges affecting The Ohio State University and the nation concerning diversity, equity and inclusion,” said Dr. Lamont A. Flowers, the Distinguished Professor of Educational Leadership and executive director of the Charles Hamilton Houston Center at Clemson University. Flowers, Gilbert, Dr. Jerlando F. L. Jackson, of the University of Wisconsin-Madison and Dr. Chance W. Lewis of the University of Charlotte have shared a friendship with Moore since their days as graduate school students. For Jackson – the Vilas Distinguished Professor of Higher Education and director and chief research scientist at Wisconsin’s Equity and Inclusion Laboratory at the University of Wisconsin-Madison – OSU’s decision to place Moore at the helm of their diversity efforts is significant.